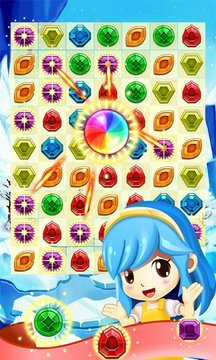 Stunning Match-3 jewel game for all players for FREE! You’ll find your perfect match with 3 breath taking modes, from the cascades of fun in Classic to the fast-paced, time-based Diamond Mine! - 2 play modes (Arcade & Classic), 3 worlds with full 300 levels. - Game play type Match 3 & Puzzle. - 7 diamond (jewel) types and many beautiful effects. - Beautiful & sharp graphic, funny sound effects. 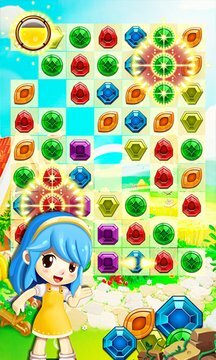 - Combine to create new powerful explosion jewels: boom, get score in horizontal or vertical line, score all jewels with the same color. - Increase time with ’time diamond’. - Delete a random jewel when reaching a specific number of jewel automatically. - Suggestion feature if there isn't any move for 5 second. To achieve high scores, this game requires strategic thinking. You have to think ahead, and use the power-ups wisely. Have fun and good luck with Jewels Star!